Gerberas flowers are the modern messengers of your feelings. They represent happiness in general. Send flowers on joyous occasions to your loved ones. 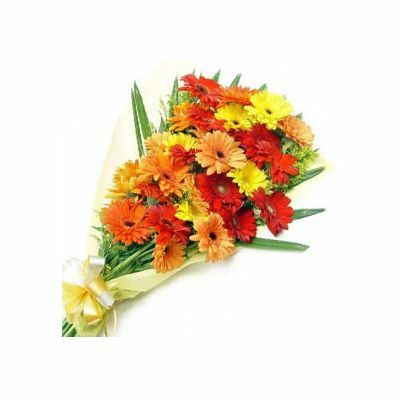 Our 18 Mixed Gerberas beautifully tied in a bouquet by our florist is extremely lovely. The colorful gerberas are artistically arranged with fillers and wrapped in colorful paper with ribbons. Send flowers online and show your friends and dear ones how much you care. Our fresh flowers make precious moments of life priceless. 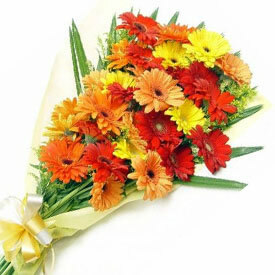 Our 18 Mixed Gerberas are perfect graduation flowers, congratulation flowers and get well soon flowers. You can also send them on baby showers and retirements or any other occasion. Our swift home delivery service and same day delivery service makes the happy moments all the more special. Consider for: Birthday, Wedding Day, Anniversary, Baby Showers, Retirement, Mother's day, Father’s Day, Gifts For Boss, Gifts For Him, Gift For Her, Valentine's day.